Oxford transmitter is situated 4 miles NE of the City near the village of Beckley, in fact some people refer to it as Beckley transmitter. The structure was built in 1962 and is 160m high, see How High is High ? 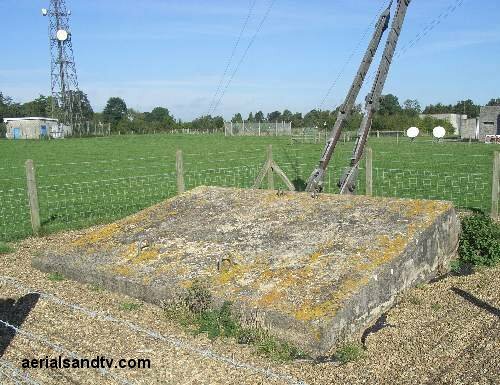 VHF/405 line TV transmissions started in 1962 with UHF following in 1968 (BBC2) and 1970 (BBC1/ITV). The transmitter can be seen on the hill from the railway between Oxford and Banbury which was opened in 1850 by the Great Western Railway as part of a route which eventually reached Chester and Birkenhead. Interestingly it was built as a broad gauge line then converted to mixed gauge in 1852 before becoming standard gauge only in 1869. 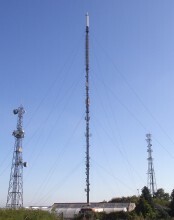 Oxford transmitter has a population coverage of around three quarters of a million. Its transmissions can be picked up in Swindon, Reading, Banbury, Bicester and Milton Keynes, plus Oxford, obviously. Overall view of Oxford TV transmitter, the structure on the left was originally built for the receive antennas when Oxford was (effectively) a VHF repeater off Crystal Palace. 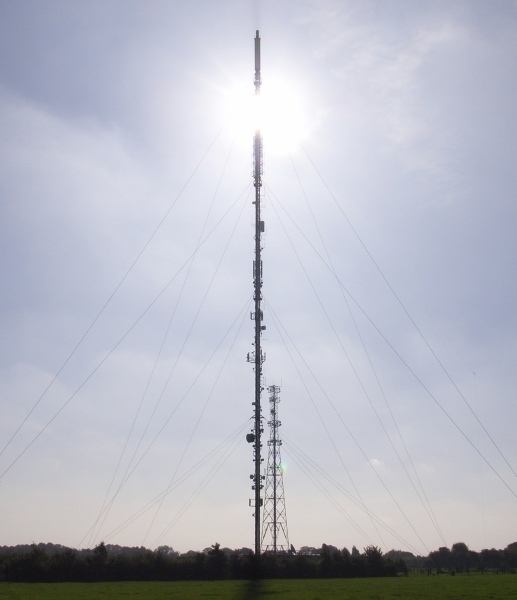 Sun shining through the Oxford television transmitter, one of my favourite pictures. 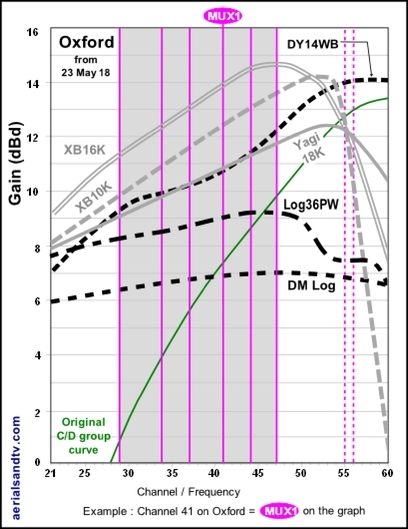 or DY14WB if you want to go wideband. Oxford is quite a powerful transmitter (joint 13th most powerful in the UK). Note the huge increase in power after the 2011 digital switchover. Oxford transmitter is horizontally polarised and it`s a K group (excl MUXES 7 & 8), see Oxford`s graph. Originally, for analogue (and digital up to 2018) Oxford was a C/D group. 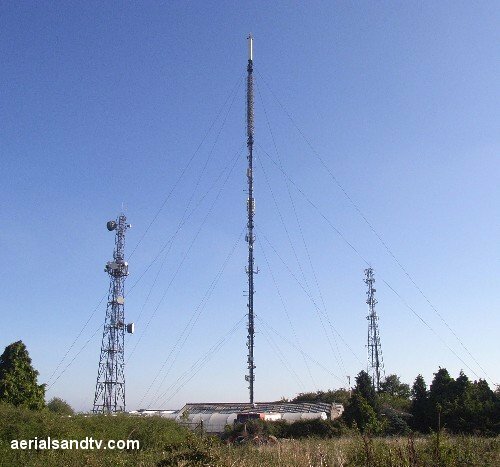 Oxford transmitter has five (smaller repeaters to improve its coverage in hilly areas (it only used to have two, but three were swapped from Sutton Coldfield at switchover). There is one ”Local” MUX allocated to Oxford on CH29 (this is within the C/D group) for a possible Oxford local TV station. In addition there are two low power HD MUXES (in the CH 31 to 37 gap) on CHs 31 and 37. These can by picked up be (decent) C/D group aerials but it must be admitted that an E group (or wideband) aerial would work better. The guide below also shows the output for the main co-receivable transmitters within Oxford`s coverage area, namely Sutton Coldfield, Waltham, Sandy, Hemel Hempstead, Crystal Palace, Hannington, Mendip, Ridge Hill and Lark Stoke. 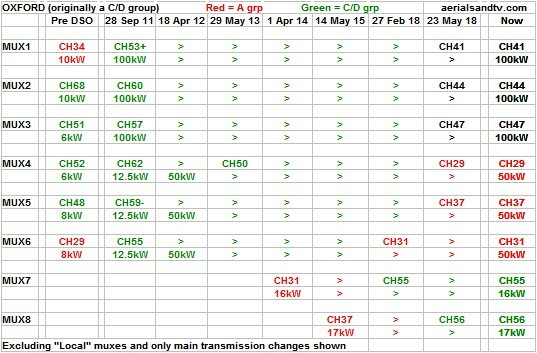 This information can be most useful for identifying alternative transmitter options or potential causes of co-channel interference plus it can also be invaluable if you are trying to find a spare channel for a modulated output (e.g. for a Sky box or CCTV system) to be added to your TV setup/distribution system. For Oxford we recommend the DM log for strong signal areas, the Log36 for medium signal areas, and the Yagi18K or XB10K for poor signal areas, the latter aerial being particularly well suited to loft mounting. The XB16K is for those with the most marginal signals. The dimensions and test performance of the aerials are on the relevant tables. Those in a poor signal area wanting MUXES 7 & 8 are recommended a DY14WB.